*Drawing Everyday*: Horse Challenge ~ What Am I Doing Wrong? Ok friends, I got one, just one person, to send in their horse head challenge this week. What am I doing wrong? Why isn't anyone else participating? Go ahead. Be truthful. Tough love. I can take it. I could really use some feedback here folks. I can't believe that none of you has a half an hour to draw sometime during the week. It doesn't have to be a masterpiece and can even be a doodle on a sales receipt. A word of warning though, it probably will take you out of your comfort zone a little the first couple of times. Just remember, it takes practice to get into "the zone" with drawing. It's hard for me sometimes too. I just keep talking to myself; "It's just a shape, look at the shape, it's not a thing." Even if you don't send it in or post it, just do it! Do it for yourself and please (as a favor), do it for me. If you tell me you did one, I'll believe you. 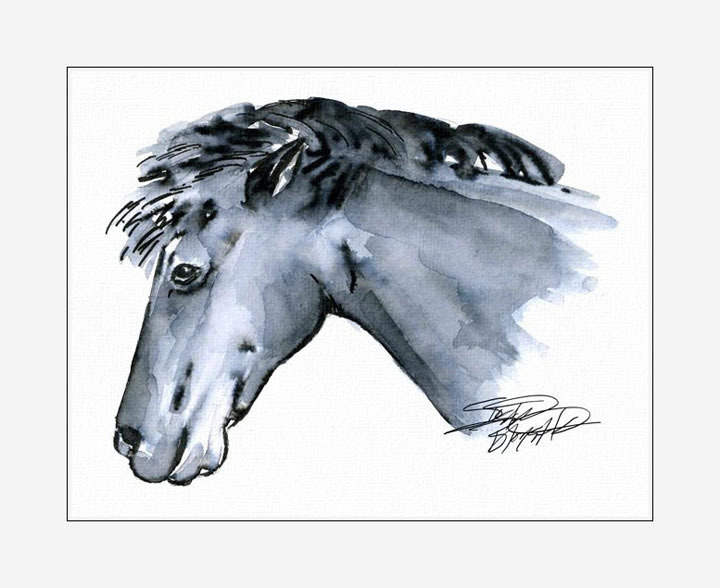 Susan Bronsak is a fabulous artist with a very lively and informative blog and website. She has been following along pretty religiously with me for the past twelve days. Check out her blog and this post to see the reference for her sketch. She tells me that my drawing everyday has rekindled her inspiration and desire to draw. Thank you Susan. You make this so much more fun for me! Your drawings are super and your enthusiasm is contagious! Here's my finished drawing with watercolor wash applied. If anyone is interested in another challenge, let me see a show of hands. 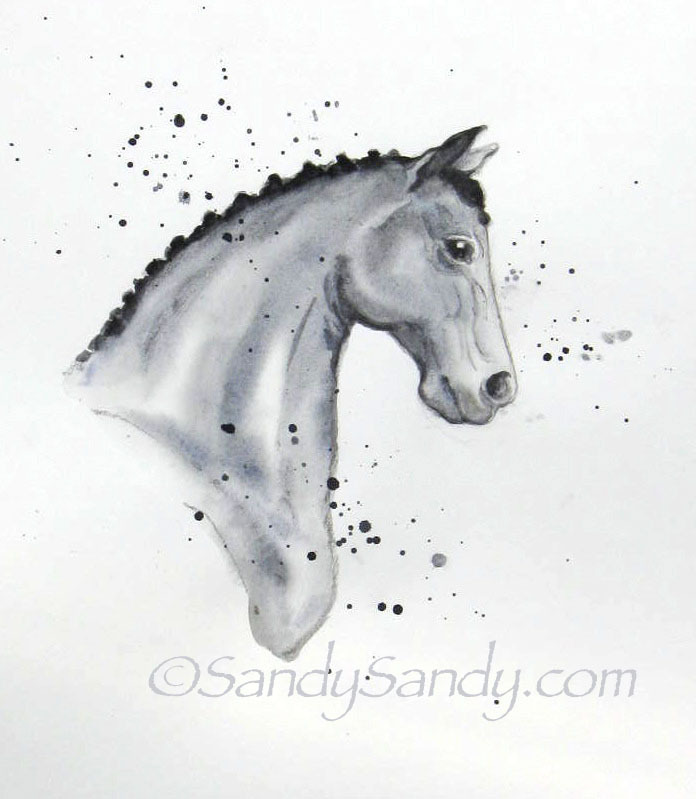 Thankyou Sandy for the encouraging words about drawing for I always feel it has to be perfect. Did some drawing this week and felt like it was horrible but will keep looking for you and just keep trying and not for perfection. Thankyou again. 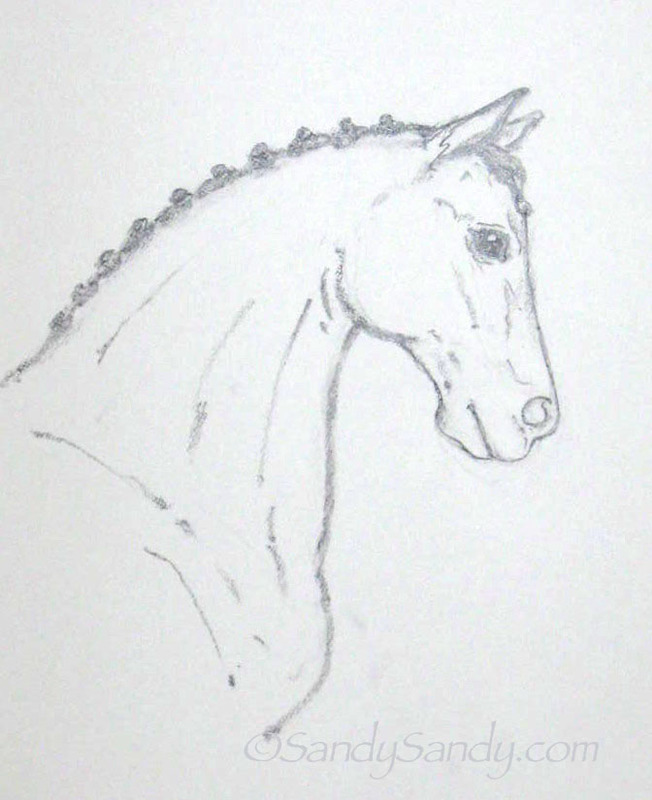 Encouraged by your blog post I will send you a horse drawing via e-mail. As I am "doing hands" this week the drawing has been done a week ago - I hope you won't mind! Thank you for your beautiful comment. Truly appreciate it. Your spattering effect to me just adds a bit of magic to your work. I love it! Just a suggestion. You seem to study and sketch one object at a time. Perhaps you would want to sketch one object in relationship to another. This may prove to be more interesting, looking at the negative spaces between things and how lines intersect. I think what you are doing is beneficial. After all, seeing is the key to good art work. So carry on.